Fall has officially arrived! Cozy knits and cool coats are key in cool weather, but ultra-tailored pieces are a standout trend for the season with a decidedly smart autumnal look. From sharp shirts to trim blazers and classic plaid, menswear influences bring an added touch of polish to wardrobe staples whether you’re dressing for work, a relaxed weekend, or an evening out — without the stiffness of formal suiting. It’s all about juxtaposition and playful nuances for a freshly styled look — like an oversize button-down shirt with slim pants and barely-there strappy heels, or white booties and a boldly colored sweater to punch up a checked skirt suit. To further demonstrate the allure of menswear as womenswear, we’re decoding the trend with five easy-to-wear outfits. Trust us, it’s easier to pull off than you think — in fact, we’re certain you’ll totally fall for the trend. 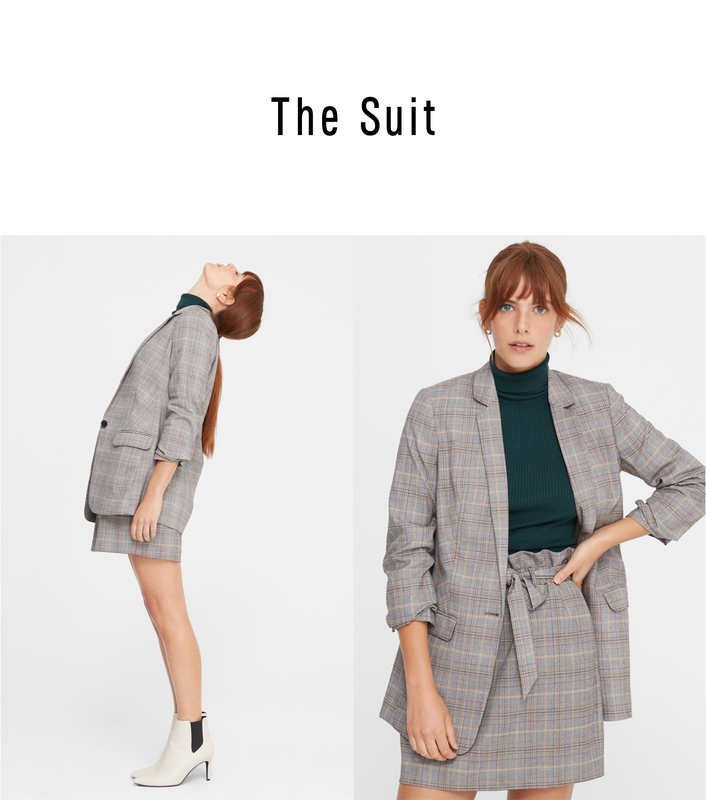 Suiting continues to be a major trend this season, and this take on the skirt suit feels fresh. For a skosh of playfulness, white ankle boots and a colorful knit punctuate neutral plaid. The finishing touch? Sleek golden hoops. From windowpane checks to tartan, plaid is a staple of menswear-inspired style. For an unexpected take, go for matching separates paired with lug-sole boots and a chain-link bag — the effect feels both so ‘90s and so right now. 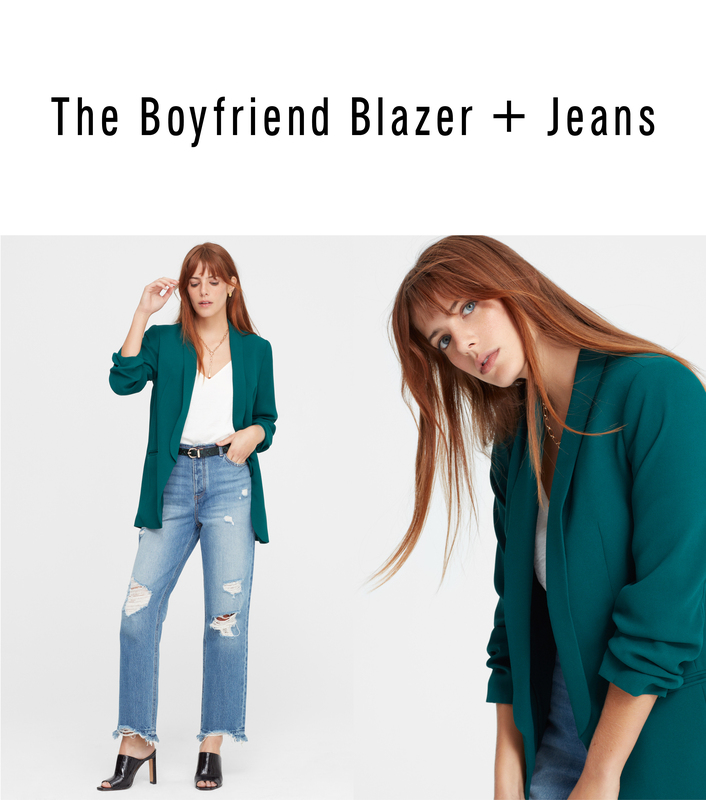 Pairing an oversize blazer with boyfriend jeans may seem like overkill, but not if you choose the right silhouettes, colors, and accessories. For a versatile outfit that goes from day to night, a topper in a fun color, lightly distressed denim, a textured belt, chain-link necklace, and patent mules read sleek and stylish. The white button-down shirt is a wardrobe staple. An oversize fit (this one’s from our men’s collection) worn over slim-fitting pants captures that borrowed-from-the-boys feel while strappy sandals and vibrant drop earrings lend a luxe, ladylike touch. Edge up a cozy knit by trying an unexpected color and teaming it with a sleeveless turtleneck, (Minus The) leather shorts and your go-to black booties.